I’m always on the lookout for art of the speculative that subverts history and our expectations. 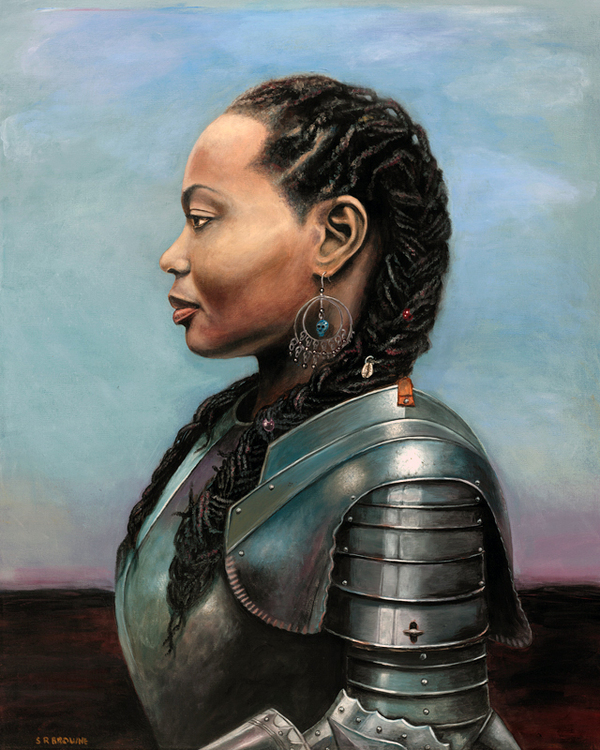 Enter artist S. Ross Browne’s exhibit Self Evident Truths. In this 2012 exhibit, mostly women of African descent are portrayed. Each is dressed in early or late medieval European armor or royal dress, in poses that mimic popular Western art of the time. Each however manages to hold onto a distinctly non-European identity–rooted in their elaborate and richly decorated locs, a part of the modern African Diaspora now familiar throughout the Black Atlantic with its own royal/regal history that links to an unknown but celebrated African past. In several of the images, the women wear clothing tinged with symbols of death–ghostly skulls, and what looks like the embroidery from the hull of a slave ship.